This is the infective L3 larval stage of a worm-parasite of Roe Deer. The adult worms produce eggs in the gut of the deer which are then expelled in the droppings. The larvae hatch and feed on the organic matter in the droppings, going through stages one and two. They then enter the L3 stage and become "en-sheathed" - totally encased in a flexible membrane. You can see the membrane at the tail on the upper larvae and at the head end in the lower picture - also on the inside of bends where it is deformed. They can no longer eat but they are still very mobile and move through the moisture in the grass. The larvae that are then eaten by the deer will enter the adult stage in the gut and start producing eggs. There are many different genera of parasitic worms with very similar life cycles affecting ruminants, most are host specific but some are not. As this came from Roe Deer droppings and the morphology fits I think it may well be Ostertagia spp. but if someone has a different idea please let me know. The photo is a composite of two photos of the same worm, it's around 850 microns long. 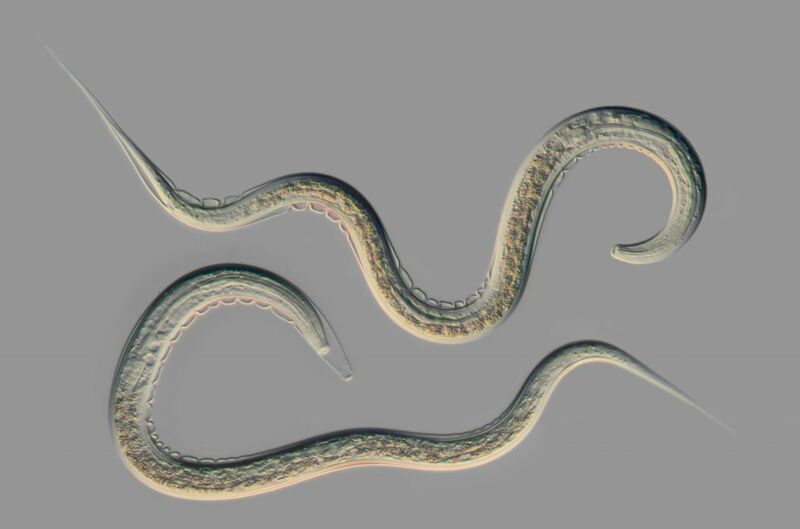 Edit: i forgot to mention that the sheath protects them to some extent from dessication and temperature extremes while they wait to be eaten and is a good (but not infallible) way to differentiate parasitic worm larvae from free-swimming nematodes. The sheath is "dissolved" in the gut of the ruminant and that triggers the progression to the adult egg-laying stage. Excellent and very aesthetic image ! Very informative and great photos!